The idol drama In Time with You starring Ariel Lin and Chen Bo Lin aired its final episode on December 11th, 2011. In the drama, Cheng You Qing played by Ariel Lin finally see clearly her own feeling, the romantic relationship with best friend Li Da Ren eventually blossomed. In the short 2 hours of broadcast on the night, two persons even make up at one go for the lack of intimate scene in the previous 12 episodes, kissed sweetly continuously for 7 times, causing the sound of envy constantly appeared on the Internet. After the premiere, the ratings of In Time With You has been kept increasing. The story plot is close to daily life of the mass, easily resonating with the public, and the drama used to be evaluated as different from past idol dramas. But despite all the advantages, the drama had never exceeded the strong opponent, the Office Girls broadcast on another channel, letting many fans and production team felt a pity in the heart. 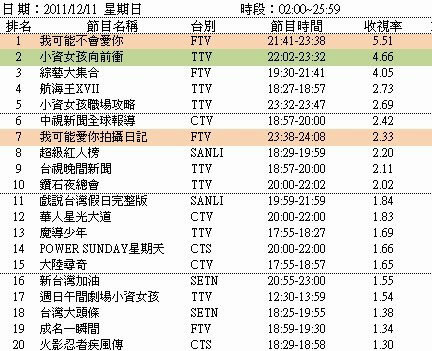 But on December 11th, 2011 on the broadcast of final episode, the rating surged to 5.51, overtaking Office Girls which rated 4.66 for the first time, crowing the throne in ratings, also considered to engage in a beautiful battle.